1986 Carlow-London Assoc. Annual Dinner Dance. Back row: Jerry Feeney, Ned Dunbar, P.J. Byrne, Fr. Clard Malone, John O’Brien, Jef Shannon, Joe Murnane, Tom Curry, Mrs Humphries, Jim Humphries. 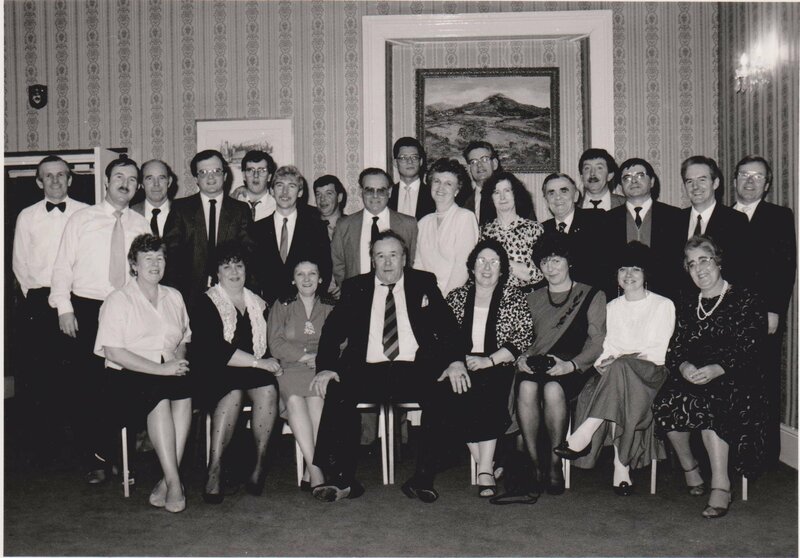 Middle row: Margo Feeney, Mick O’Neil, Jenny, John O’Brien, Jenny Chwab, Peter O’Brian, Denis Moran R,I.P*, Joan Keogh, Margaret Moran (*Wife of Denis), Mary O’Neil,____? ____?, Margaret Doyle, Sally Curry. Martin Donohoe (Garryhill). Guests of honour were Most Rev. Laurence Ryan Co-adjutor Bishop of Kildare and Leighlin, Padraign 6 Snodaigh, National Museum/Carlow County Heritage Society and Paddy Carpenter, Chairman Carlow Urban Council. The man standing behind Most Rev. Laurence Ryan in the dark suit is my 2nd cousin Denis Moran who died 18 Feb 1999 in Brockley, London R.I.P. They were the Dublin Road Morans. 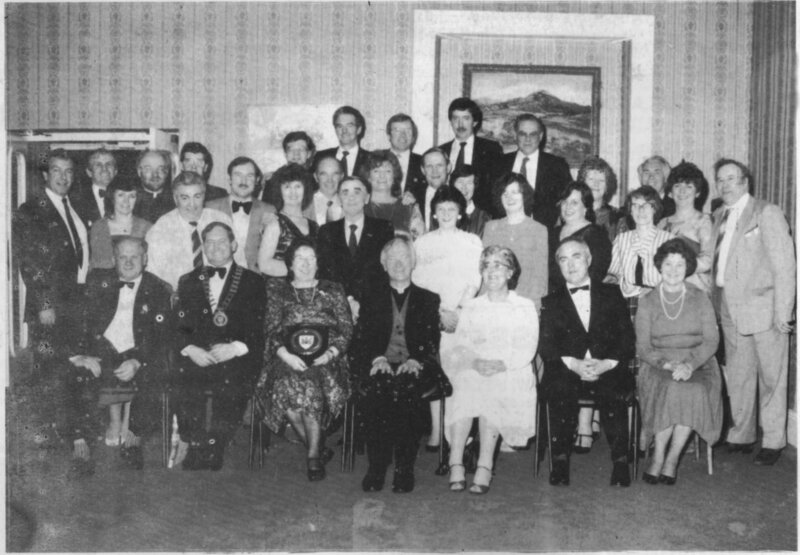 Source of image: Carlow Past & Present 1987-88 Vol.1 No.2. Back page. Another image of people attending Carlow-London Assoc. Annual Dinner Dance in London c.2005. 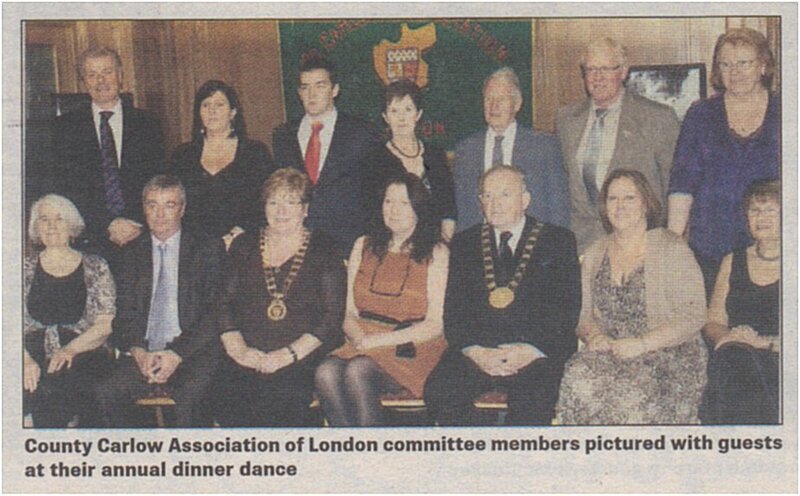 THE highlight of the year for the County Carlow Association in London took place on Saturday 27 October, when its 44th annual dinner dance was held at the Crown Moran Hotel in Cricklewood. Dancing half-sets, jigs, waltzes and boogieing to the sound of Celtic Crunch until the early hours, a great sense of togetherness prevailed and a most enjoyable time was had by all. Later in the evening, 'Sam Maguire' made an appearance, as the Donegal Association's annual event was also taking place at the same venue. Among the invited guests were the Cathaoirligh of Carlow local authorities Michael Abbey and Eileen Brophy, cllr Des Hurley and Eamonn Brophy of Carlow County Council. Addressing the gathering, Carlow Association's chairperson Claire Sturley (nee Nolan of Granby Row) welcomed the guests, whose presence meant a lot to the association in London. She also expressed the hope that more young people would become involved with the association. Claire made special reference to the Clarke/Condon family from Bagenalstown, who had booked a full table for members of their family. "That," she said, "is what has made the Carlow connection in London so strong for generations past: family and friends - long may it continue." Cllr Michael Abbey paid tribute to the members of past committees of the association and thanked all those who have served in any capacity, with much of their work unheralded and un-trumpeted. 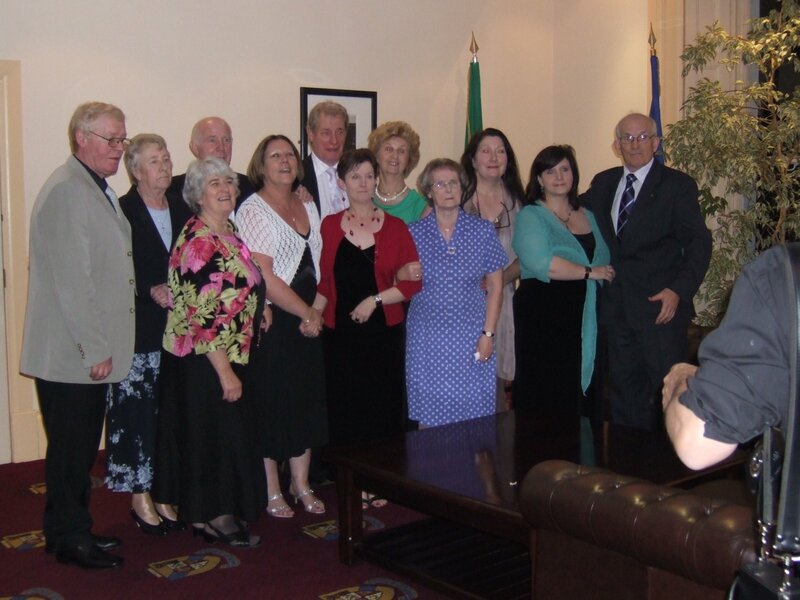 He expressed the need for support structures like the association in the UK and offered the assistance of both Carlow county and town councils in the years ahead. Michael also spoke of the development and success of County Carlow Museum and paid tribute to the dedication and selflessness of all those involved, and he invited those present to pay a visit when next in Carlow. He then made a presentation of a book Carlow History and Society to Claire Sturley. 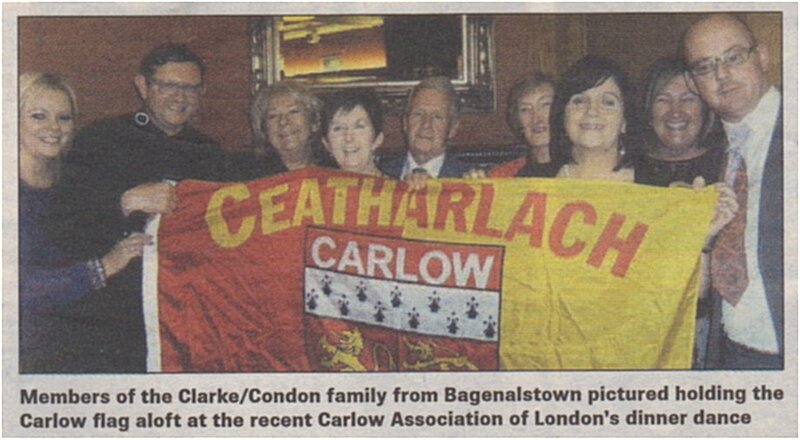 Members of the Clarke/Condon family from Bagenalstown pictured holding the Carlow flag aloft at the recent Carlow Association of London's dinner dance. Cllr Eileen Brophy also addressed the gathering and noted that "much of the work is accomplished in a silent and unobtrusive manner" and she assured the association of continued support from Carlow Town Council. She also spoke of the forthcoming Taste of Carlow festival, in which Carlow arts, crafts and produce will form the central theme. In conclusion, Eileen invited all present to visit Carlow for The Gathering 2013 and to play some part in the series of planned events that will be taking place throughout the county. 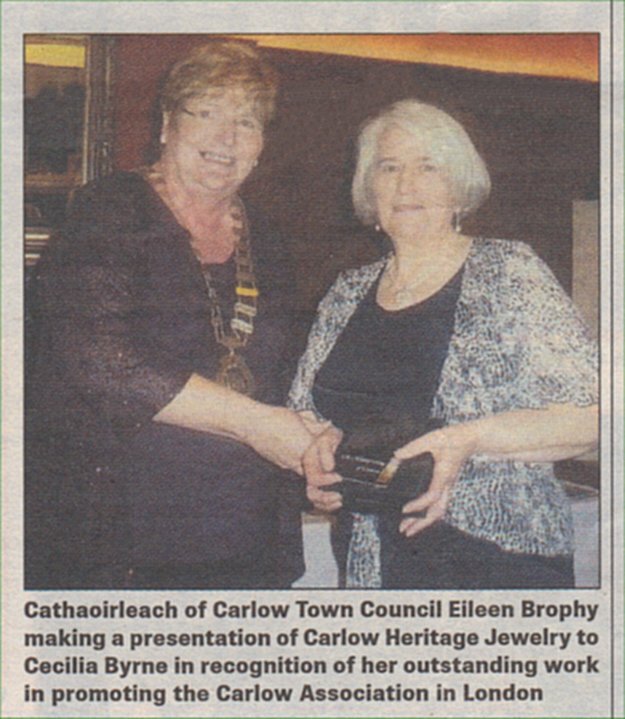 Eileen made a surprise presentation of a piece of Jewellery from the Carlow Heritage Collection to Cecila Byrne, formerly of Drumphea, in recognition of her work with the Carlow Association in London. "Cecila's work, enthusiasm and voluntary contribution is appreciated by all of us," commented Eileen.